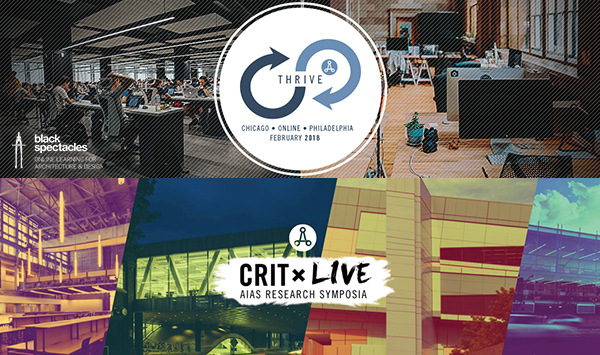 The AIAS is officially opening up a call for interest for CRIT Live: AIAS Research Symposia and THRIVE: AIAS Career Prep Program in the fall of 2019 and the spring of 2020. We are looking for one South Quad school to host CRIT Live in the fall of 2019. The AIAS Chapter would work in tandem with their school to provide a location for approximately 75-150 attendees for the day-long programming and networking reception that evening. The National Office would engage with the local chapter to finalize theming, programming, speakers, and logistics. CRIT Live in the spring of 2020 will be held in San Diego, California. The AIAS is looking for two AIAS Chapters to work with firms to host THRIVE: AIAS Career Prep Program. The AIAS Chapters would work with a local firm to host a day of programming that is devoted to career preparation. The host firm would not be required to produce all of the programming, as outside speakers may be brought in from other firms in the area. The AIAS Chapters are encouraged to work with their local AIA component to bring engaged and informative speakers. Fall THRIVE will be hosted by a school from the Midwest Quad, and spring THRIVE will be hosted by a school from the Northeast Quad. The financial burden on the host school for either event is fairly minimal, while hopefully the benefits are significant. We at the AIAS national office take care of most of the logistics, planning, and marketing, with input from the host chapter. Our primary request for CRIT Live is a lecture hall space over the course of a Saturday in October or November, while the request for THRIVE is a firm host over the course of a Saturday in October/November or February as well. Interested in hosting? Download the Summary and Logistics documentation, share them with your faculty, and fill out the form below! Applications must be received by 11:59 pm on Wednesday, May 1, 2019.